Dear Excel pros, I need some help please! I have two Excel Spreadsheets. apply this by drop it down to following rows. will not be matched as the Last Name and FirstName is in reverse order. Thanks. I will test. In sheet 2, the user name is Nana Yaa Boamah. It should show a match, right? Also, if I have the following in sheet 1 (no comma), will your formula work? You may try something like this. 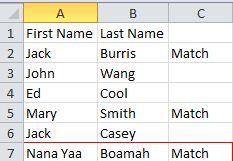 The following formula will also work if on the first sheet, names are not separated by a comma. Adjust the ranges as required. In sheet 2, the user name is Nana Yaa Boamah. It should show a match, right? yes, then it will match. accordance to match with "Last Name" + " " (space) + "First Name" format.